Experience the awe-inspiring power of nature on a trip to the Shipwreck Coast. 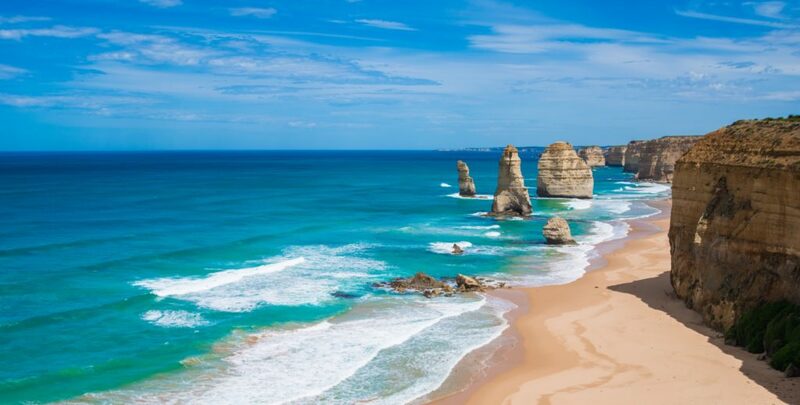 Travel the Great Ocean Road and learn about the Twelve Apostles and other spectacular rock formations. Explore Port Fairy, visit a wind farm and see the fascinating feathered inhabitants of a game reserve. Otway Fly Visit Australia’s highest and longest elevated tree top canopy walk. Great Ocean Road Stop and enjoy the sights at the Twelve Apostles, Loch Ard Gorge and London Bridge. Flagstaff Hill Maritime Museum Partake in an educational program learning about some of Australia’s most historic vessels and famous shipwrecks. Port Fairy Enjoy a guided tour of this historical port, followed by a tour of the Codrington Wind Farm. Tower Hill State Game Reserve Formed by a volcanic eruption 25,000 years ago, this park features native wildlife and volcanic formation. Geelong Pass through the city and visit the National Wool Museum. Thank you for your interest in our WorldStrides Warrnambool Tour! Please tell us a little more about yourself so we can get you sent to the right place.